In November, it was wonderful to finally have Donna, Ian, Sue and Ralph in the same room and to hear them performing together. Some of the pieces required more rehearsal than others, but we managed to get through all 10 completed songs. While some pieces were fine as they were, others needed tweaking in various forms. Graham and I each came away with our own notes, along with those suggested by the performers, which we discussed before I began the next stage of redrafts. This is what it looks like when the cat decides to knock all the pieces you’re currently redrafting off of the piano. I then deliberately ignored the physical scores for a while and just listened to the recordings of the rehearsal. Which bits didn’t feel quite right? Where was the balance wrong? How could I convey Graham’s carefully crafted words better? I recorded the whole rehearsal on my handy H4N Zoom recorder (an invaluable piece of kit) so I could hear not only how the pieces were performed, but also re-listen to our discussions about them in case I’d missed anything vital. It was then time to get back to work. Some pieces needed more work than others. For example, for A composite man, it was decided another part was needed to tie the vocal parts together. The clarinet, then, became the spirits of the dead workers and widows. Other pieces needed more bird song, or less accompaniment. The process of redrafting is always a tricky one. You listen, analyse, revisit and revise, time and time again. Often you find yourself amending a line in one fashion one day, only to amend it back to the original the next. Along with the changes to actual notes, lines and instrumentation in the redraft stage, there are also the more technical bits of music notation. Which time signatures convey the music best and ensure it makes the most sense for the performers – a non-standard beaming of 12/8 or 6/8 followed by 3/4? Should I spell my phrase F sharp – F natural – F sharp or should it be an E sharp in the middle – or G flats at either end? I’ve found that with Cracked Songs a considerable amount of this stage has been spent playing around with these nitty gritty bits. Not only do you have to make them make sense throughout one song, but the whole cycle has to be taken into consideration too – it has to make sense as the sum of its parts as well as each constituent piece, and in the way it is notated along with the actual music itself. Tweaking scores to ensure they’re as clear as possible is always a priority. If they have to puzzle over engraving they can’t immerse themselves as fully in the music. I’ve spent the month and a bit since the rehearsal tweaking and redrafting – and I’m just reaching the end of the process. 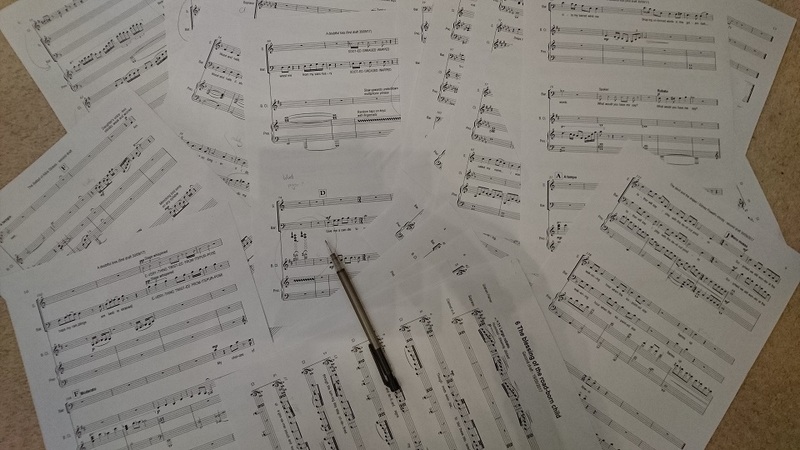 In the next few days the ‘final’ version of the scores and parts will wing their way over to the Cracked Voices performers, ready for them to look at for the next rehearsal. Along with polished final versions of the previous drafts there are two new pieces – the final two songs of the cycle. That double bar line really is only the beginning. This entry was posted in Blog on December 13, 2017 by Jenni Pinnock. I have heads and tails but no legs. (Hover your cursor over the riddle to see the answer). When I’m young, I’m tall. When I’m old, I’m short. We’re sure you can do better than that, so here’s your chance to try! This International Puzzle Day (29 January) why not try writing your own riddle and send it to us? (If you want some help, visit our blogpost on riddle writing). Simply type your riddle and answer (only clean ones please!) in the ‘Leave a Reply’ box and we’ll post the best ones. This entry was posted in Riddles on December 4, 2017 by Jenni Pinnock. 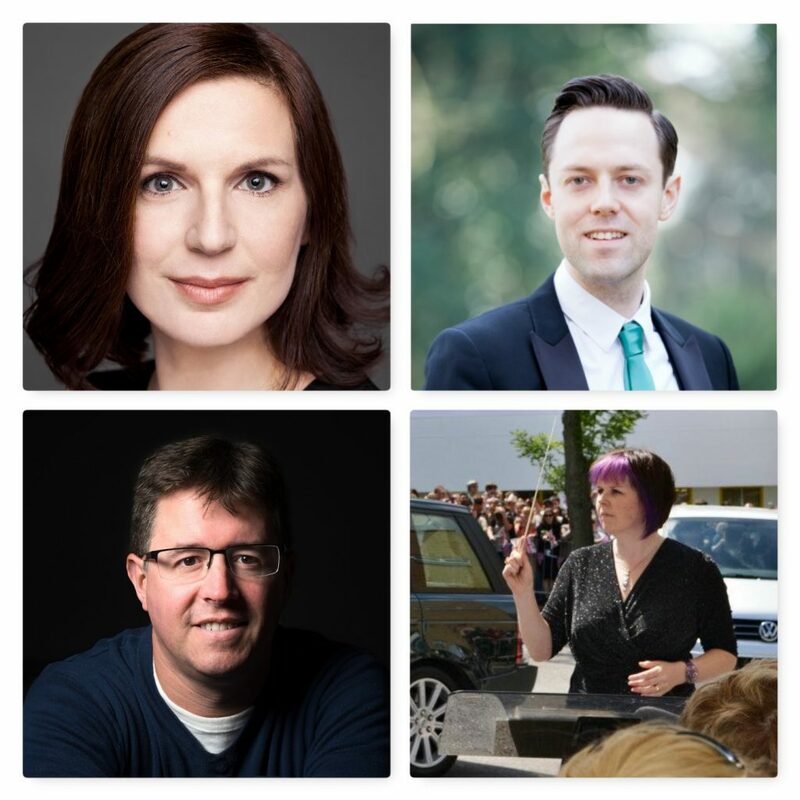 Meet the Cracked Voices performers! Following our call for performers earlier in the year, we’re pleased to be able to share our fabulous Cracked Voices performers with you! We’re delighted to be working with Ian Beadle, Donna Lennard, Sue Pettitt and Ralph Woodward to bring Cracked Voices to life. Top row: Donna Lennard, soprano and Ian Beadle, Baritone. Second row: Ralph Woodward, pianist and Sue Pettitt, clarinettist. Ian Beadle was born in Hertfordshire and studied at the Guildhall School of Music and Drama where he obtained a BMus (Hons) degree and Guildhall Artist Masters, as a scholar under the tutelage of Professor John Evans. In 2012/13 he was a part of the English National Opera’s Opera Works programme. Operatic experience includes the Bridegroom The Vanishing Bridegroom (British Youth Opera), Figaro Le Nozze Di Figaro (Opera Brava), Des Grieux Le Portrait De Manon, Belcore Elisir D’Amore and William Dale Silent Night (Wexford Festival Opera), Masetto Don Giovanni, Marco GIanni Schicchi, Quinault Adriana Lecouvreur, Jake Wallace La Fanciulla Del West (Opera Holland Park), Valentin Faust (Winterbourne Opera). Ian sang Bass soloist in a Messiah at the Palau de la Música, Valencia for the Philharmonia Chorus. Donna Lennard grew up in Bedford, and trained at the Guildhall School of Music & Drama, attaining an MPerf with Distinction, and on ENO’s ‘Opera Works’ programme. Her operatic roles include Frog in How the Whale Became (ROH), Selene in Tycho’s Dream (Glyndebourne), Alice in Airborne (Nova Music Opera), Despina in Così fan tutte (Cooper Hall Emerging Artists), Yellow in The Anatomy of Melancholy (bodycorps), Catfish in The Catfish Conundrum (The Music Troupe for Tête à Tête), Susanna in The Marriage of Figaro, Frasquita in Carmen, and Pamina in The Magic Flute (Opera Loki). Other stage work includes performing in the UK tour of May Contain Food with dance company, Protein, and the role of Madame Viardot in Salon Musical, a project initiated by pianist Marc Verter that recreates French salon concerts from the late 19th Century. Sue came down from Lancashire in 1987 to study clarinet under John Stenhouse and Nick Bucknall at Trinity College of Music. After graduating with an FTCL in 1991 she started to work for Hertfordshire Music Service which she does to this day. Sue is the head of Royston Music School and conducts the North Herts and Stevenage Windband. She is also in great demand as an orchestral and pit musician across the whole of the South East. When not involved in the musical world she can be found chasing her young puppy around the garden trying to stop it from digging up the lawn! Ralph Woodward grew up in Durham, and studied Music as Organ Scholar at Queens’ College, Cambridge. He is now Musical Director of the Fairhaven Singers, Full Score and Orchestral Score. He has played concertos on three instruments, worked in over 25 countries, and conducted the London Mozart Players, City of London Sinfonia, The Parley of Instruments, English Chamber Orchestra, and Britten Sinfonia. He carries out a wide range of editorial tasks for Oxford University Press. Past projects have included work with Vladimir Ashkenazy, Emma Johnson, Iestyn Davies and Cradle of Filth, and an appearance on ITV’s Grantchester. Ralph also manages a cricket team and is a keen badminton player and a good steady drinker. This entry was posted in News on November 13, 2017 by Jenni Pinnock. This Friday, Jenni will be the guest on Huntingdon Community Radio’s Spotlight programme! She’ll be talking with presenter Melanie Green about Cracked Voices. 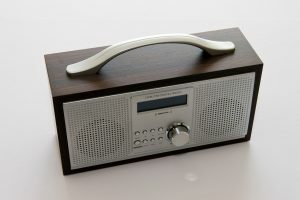 If you’re in the local area you can listen via you radio, or you can listen online at http://www.hcrfm.co.uk/ . You can also call, text or email your questions in! This entry was posted in Press on September 20, 2017 by Jenni Pinnock. A composite man – a composite piece? To find out the background to this piece, read Graham’s post about writing this poem – Not knowing… (part 2). I pick up straight up where Graham stops – with the finished poem winging its way over to me. When Graham sent me his first version of this poem, it was clear the two conversations needed to be two separate entities, yet presented as one overall picture of the scene. I could already tell that the two characters- the (dead) coprolite digger and his wife – needed separate musical identities and songs, and had the idea that their singing should be entwined for the final stanza of the piece. Graham’s final presentation of the two monologues – a modern composite of two conversations- furthered my original thoughts. If the two characters are ignoring each other, they must therefore be talking about separate things – having two conversation which occasionally collide. As a result, I decided to write a separate song for each character which would begin as separate entities, but overlap more as the piece progressed, eventually being presented almost simultaneously. The first voice is that of a dead coprolite digger- which Graham has based around the skeleton of a folk song. Wanting to work along similar lines, my setting of this is centred around a folk or work song. It’s quite a simple melody, in three, catchy with a strong down beat. In contrast, the wife’s song is more lyrical, in a completely different tonality and has four beats in the bar. Choosing the tonalities for the two different songs was tricky. I deliberately picked tonalities that suited each, but was mindful of making sure they’d have elements of both dissonance and harmony. The three in a bar folk song is in C minor, while the soprano’s melody drifts between E flat minor and E flat locrian. This combination creates plenty of room for dissonance, but yet space for moments of harmony too. Think of it as one vocalist singing Twinkle Twinkle (major) while the other sings Teddy Bear’s Picnic (minor) a few notes lower – and adds in some colourful extra accidentals! Below is a rough diagram of how the voices are sliding over each other (and combining!) at the moment – at the stage where I’m tidying up the first draft of the piece. As you can see, for the first stanza the voices only momentarily overlap at the end of each phrase. The moments of overlap (or alternating phrases) increase in the second stanza, bar one line. They increase further as the piece progresses, until they’re almost completely entwined in stanza four – save for the last line, where each can be heard independently again – each saying their piece to end the conversation. Of course, this method of creating a piece brings further questions with it. How do you ensure each part is heard fully (or do you abandon that entirely?). What time signature(s) and key signatures(s) do you use, and how do you ensure the vocalists maintain the original feel of their songs when they’re being pushed and pulled around a bit time and tempo wise? All good questions – all of which I need to answer as I finish drafting A composite man ! This entry was posted in Blog on September 4, 2017 by Jenni Pinnock. Scales and arpeggios – not just for exams! Scales are a staple of musical life. If you learn a musical instrument, you end up playing them (sometimes seemingly endlessly!) and learning how they work is an important chunk of musical theory. Not all scales are created equal. Western music relies on equal temperament, where the octave is divided into 12 equal parts, or semitones. However, our perception of the musical world as a whole is based on just intonation and the harmonic series. As a result, rather than all sounding the same, scales in equal temperament each have a different feeling. I once did a survey to try and find out composer’s favourite scales, but ultimately it depends on the piece in question. For example, I find E major a bit too ‘major’, but E flat major more rounded, with D flat major being a favourite. Minor wise, I’m not a huge fan of A minor, but E minor or C minor I do like, and D minor feels very traditionally ‘minor’. As a result, finding the tonal centres and scales to use in a piece are a fundamental point for me. They have to work with the piece, its feeling, and with the performers in question too, as transposing to another key often feels rather wrong. Major and minor scales are those focused on most in traditional music exams. Chromatic scales (using all 12 semitones in an octave, white and black notes) are practiced too, and some exams include pentatonic (five note- think Javanese gamelan!) and whole tone (dream sequence) scales too. For this piece I wanted something slightly more unusual than any of the above. The blessing of the road-born child is a mother’s song to her child, born on the road. The tonality needed to be something not too major or minor, and with a bit of a twist. Instead of looking at the traditional majors and minors I headed to the modes – seven scales which all have different combinations of intervals, giving them distinct sounds (for more on modes, see here). Although I studied them extensively at university (we had to identify them by sound in pieces!) and I know they’re focused on in jazz exams, they’re a scale that’s less well known today outside of the jazz community – maybe due to their lack of inclusion in standard classical exams. Playing with different modes, the instant solution was the phrygian mode. The minor second interval at the beginning means it’s not used as much as some of the other modes, but it felt just right for this. However, I wanted to have the major 7th at the top of the scale alongside the minor one. This left me with two scales to work with: The phrygian dominant, and the double harmonic major. The next task was to find where they fit best on the piano, if at all. This involved playing around with them on the piano, sketching out some ideas and seeing what felt right. Graham and I had already discussed instrumentation for this piece and we knew we wanted to go with a clarinet and soprano duet, ignoring the piano completely. A bit of singing and improvising on both instruments playing with the scales cemented E being the tonic to begin with, rising to F towards the end. It was a little later that I discovered the alternative names of the scales I’ve picked to centre the piece around. Both are often referred to as gypsy or gipsy scales – phrygian dominant the Spanish gypsy scale, and the double harmonic major scale as gypsy major. Clearly they were meant to be! This entry was posted in Blog on August 6, 2017 by Jenni Pinnock. Our first educational workshop got a mention in this week’s Royston Crow (Thursday 3rd August) – click here to read the article. This entry was posted in News on August 4, 2017 by Jenni Pinnock. Educational workshops form a central part of the Cracked Voices project. We want to show what a fabulous and accessible medium art songs are, and what better way to do it than to support students in writing them? On a hot Thursday morning, the Cracked Voices team descended upon Meridian School, Royston for an introductory workshop. The aim was simple: to come up with an entire song in one morning! We had a helping hand in that Graham had written a chorus-type text out, but other than that the material was to be created entirely on the day. The session began with a quick discussion on Cracked Voices: the song cycle, what we’re doing, and how we wanted the students to be involved. Then the writers got to work on creating their own verses to include in the song – pairs of 10 syllable lines about the items they wanted to go into the memory box. In the meantime, the musicians had a brief theory blitz on art songs, text setting and analysis with Jenni before jumping into the composing! 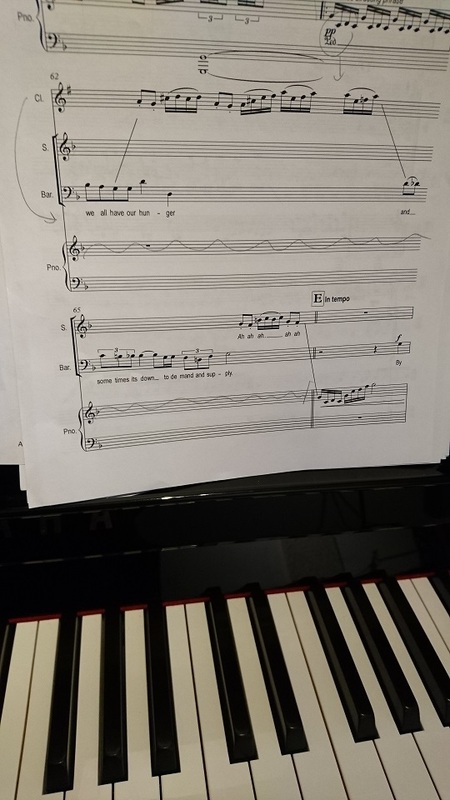 Having decided on rough rhythms for the text, the musicians separated out to improvise ideas, before coming back together to piece the chorus together a line at a time.They then worked out some chords for each bar or phrase, and hey presto – a chorus was born! They also blitzed a quick melody line that might work with the verses. After a quick break the writers joined the musician to share their work. They had created four stanzas of four lines each – finding the right ideas and fitting them into 10 syllable lines had proved a challenge, but one they had risen to. They had also made the decision to rejiggle the order of the choruses, meaning some last minute changes on the music side, alongside some quick improvisation on the rhythms of the verses. After rehearsing the song a few times through, making changes and edits as we went (suggested by musicians and writers alike) we recorded the final song. Overall, a highly successful morning, giving everyone a taster as to what the main project will entail, alongside a few fundamental techniques they could use. For the workshops in the autumn, the writers will work on their own (with plenty of support from Graham!) to create their own texts. It’ll then be down to the composers to set them to music, with the results either to be performed by the Cracked Voices performers alongside the main song cycle (in April 2018), or to be performed by themselves or maybe even the school choir! Thanks to Jenny Warburton, Nick Smith and Meridian School for letting us run the workshop – we’re looking forward to the next one in October! Thanks also to the Arts Council’s Grants for the Arts for funding the workshops. Pictures used from the @MeridianPAD Twitter feed with permission. This entry was posted in Blog, News and tagged art songs, composing, memory box, Meridian School, song cycles, workshops, writing, writing process on July 19, 2017 by Jenni Pinnock. Last Sunday (4th June) Graham and Jenni were on Cambridge 105 talking about Your Voice. Click here to listen to the podcast! This entry was posted in Uncategorized on June 10, 2017 by Jenni Pinnock. On Monday 12th June Graham and Jenni will be on BBC Radio Cambridgeshire with Jeremy Sallis on Lunchtime Live. They’ll be talking about Cracked Voices and Your Voice during the local arts and entertainment section sometime between 2 and 3pm! This entry was posted in Press on June 9, 2017 by Jenni Pinnock.